Tell me about home projects you're working on. 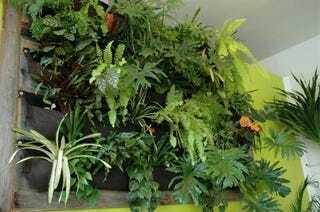 I'm in nesting mode, it always hits me this time of year, and so I'm considering things like turning the wall behind my couch into a living wall using homemade Wooly Pockets. Or maybe I'll do that in my sparse bedroom? I haven't decided. What cool things have you installed in your living space? I've already expanded my kitchen into my dining room and put up my pole corner, and that's on top of last year's welcome shelving and chalkboard plant bench I IKEA hacked last year. Inspiration is welcome!